Is Ailihen M10 better allover In ear headphone than the Betron B-25 ? 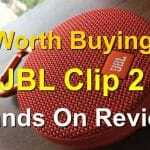 JBL Clip 2 Hands on Review | is it Worth Buying? Android Oreo 8.0 – What’s New & How to Update | How is it Better ? Tile Slim vs Chipolo card vs TrackR Wallet 2.0 : Thinnest & Loudest ? JBL Xtreme vs Ultimate Ears MegaBoom which is Best?